The first step is dropping passwords and using ssh keys. Not only does this free you from entering your password every single time, but it dramatically increases the security of your remote machine. This is done by generating a new pair of keys, setting a password for them (if you feel like it), sending then to the remote machine, and eventually disabling password access. If you added a password to the ssh key pair you will be promoted for it. At this point, you can add the password to your keychain and you will not be required to introduce it again. It is now that iTerm2 profiles come handy. 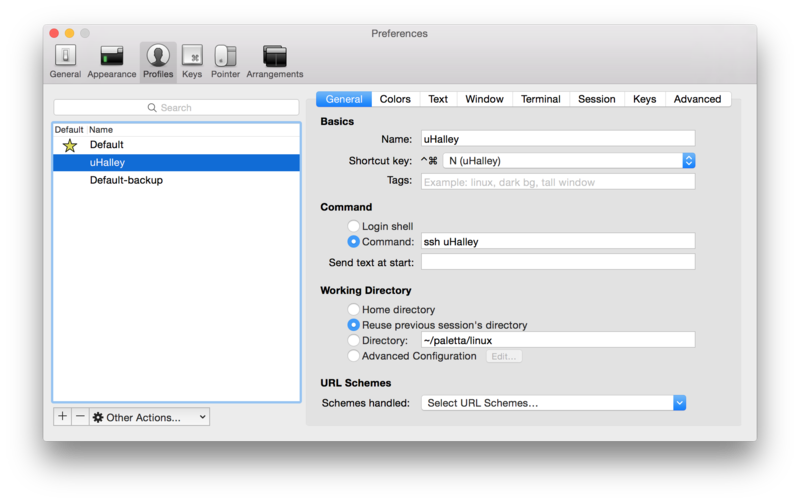 You can create a new profile in iTerm > Preferences. Here, you simply introduce the SSH line to the command entry. You can also define a shortcut. However, iTerm limits the shortcut definition We will see afterwards a better approach to this. This way, if I press CMD-n a new “local” terminal window opens; if I press CMD-Shift-n a “remote” terminal window opens (to uHalley in this case). You can add as many profiles and shortcuts as you want, thus delegating the memorizing to your fingers. Finally, I always show the name of each machine in the prompt so that they are easy to recognize. You can see my zsh configuration inside YADR also in my GitHub. It is also possible to use different color schemes per profile so that you can visually recognize the terminals. I do not do this; the prompt has proved to be more than enough. Besides, I always use salaried. This entry was posted in Development Tools, Linux, MacOS, Tips and tagged iterm2, Linux, Mac OS, Setup. Bookmark the permalink. Reblogged this on My Digital Cravings…….